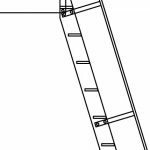 Ship ladders typically have a riser height between 9″ to 11″. They have a tread run between 4″ to 6″. 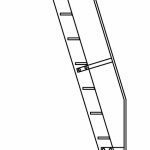 Ship ladders are very sharp angled stairs, so we recommend having a handrail on both sides for ease of use. 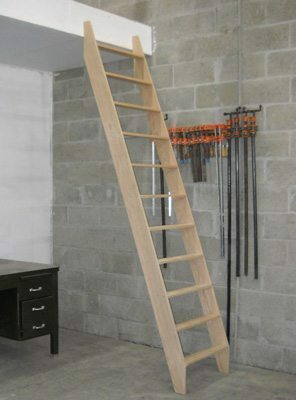 The ship ladder pictured here has oak treads and oak stringers. 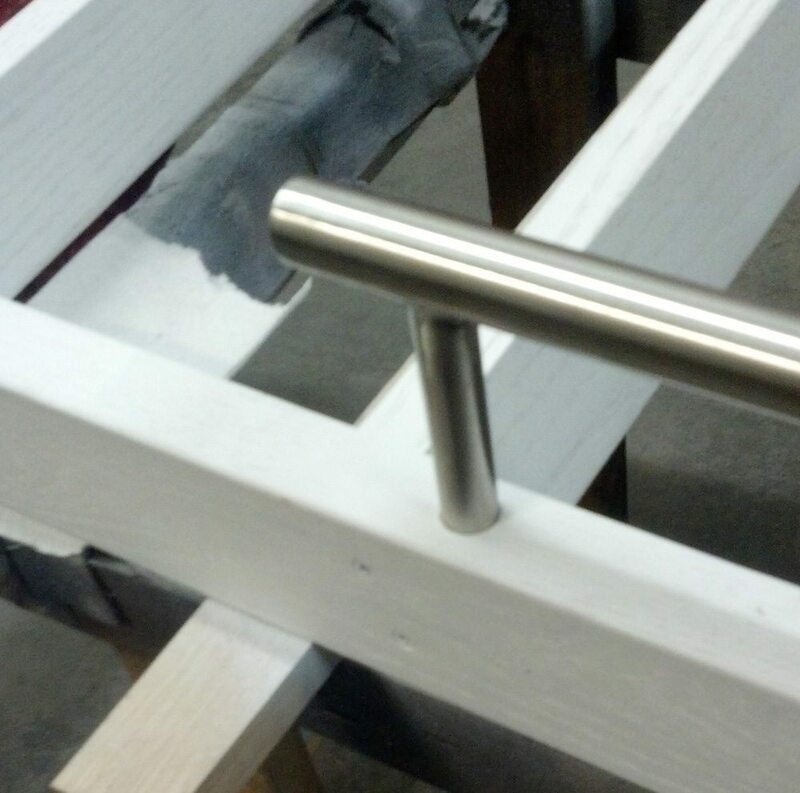 The handrail is brushed stainless steel. 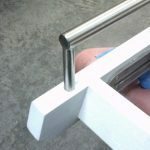 All of the bolts, screws and mounting hardware is also stainless steel. 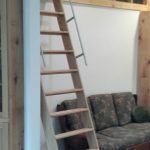 At Acadia Stairs, we can sell just the stainless steel hardware, brackets and rails if you wish to craft your own wooden structure, or we can provide the whole kit. 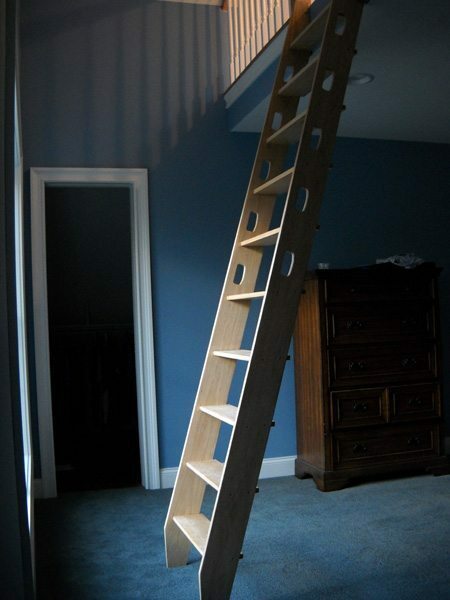 These ladders are available in a wide range of finishes, depending upon your decor. 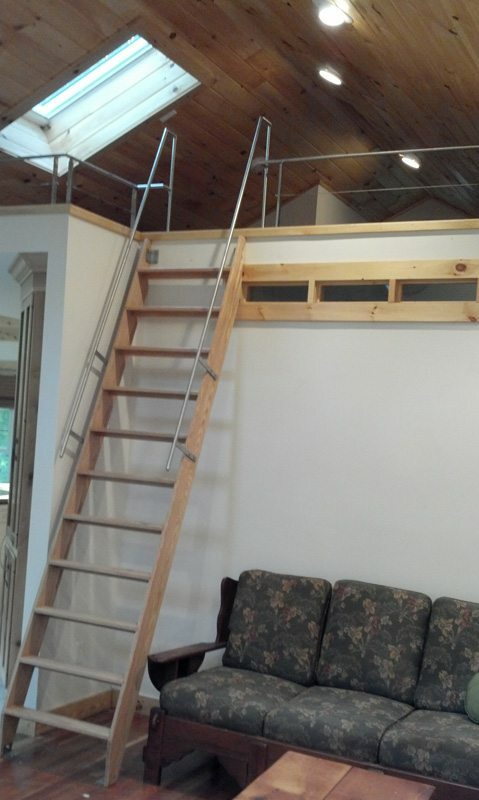 A ship ladder with a railing that levels off at the top is great for hatchways or low ceilings. 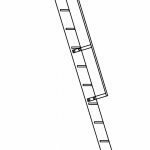 Also available are ship ladders with safety railings. 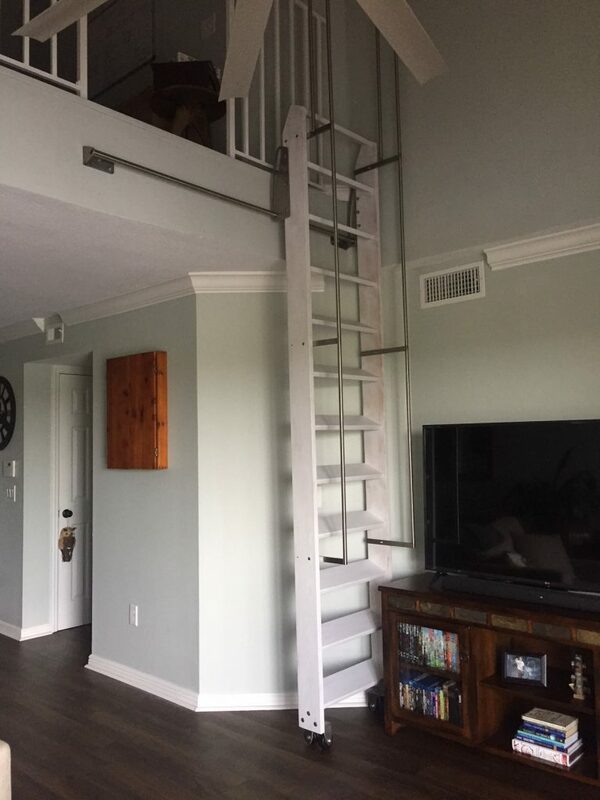 This rail comes up to the full height of a normal balcony rail. You can also choose to have standard steel rails on both sides of the stringer. The handrail is typically 3/4″ round steel or stainless steel. 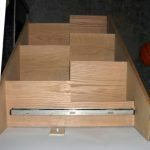 This railing style can be retro-fit to almost any steep stair or ladder. 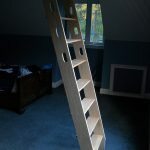 Another option is the loft ladder with oak stringers and oak treads. In this version cutouts were made for hand grips. 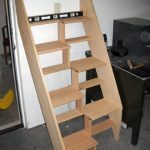 Here is the back view of the open riser stair. It has an open look for form and function. 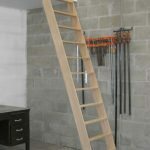 This shows the side view of the ship ladder with handle grips cut out into the oak stringers. 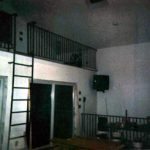 This custom ladder is made of steel for the most strength and simplest look to match the stairwell railings and the balcony rails. 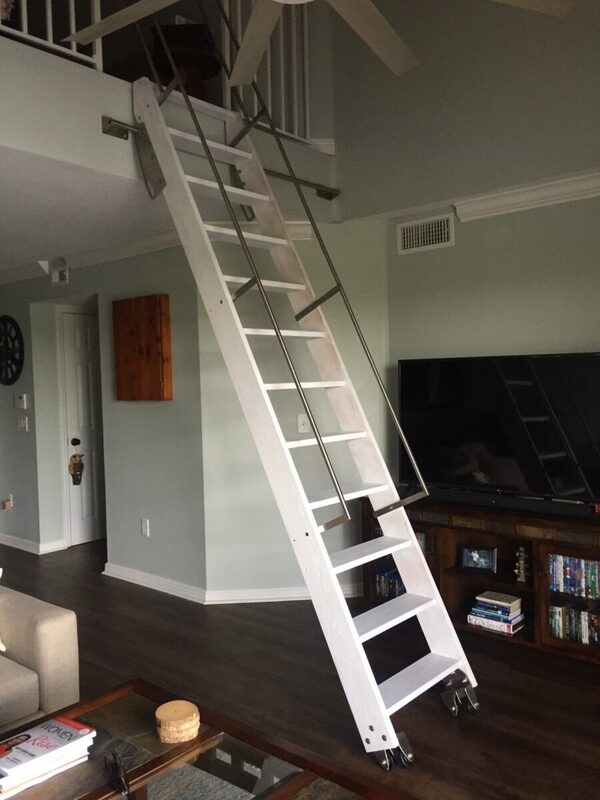 This ladder goes up 90 degrees. 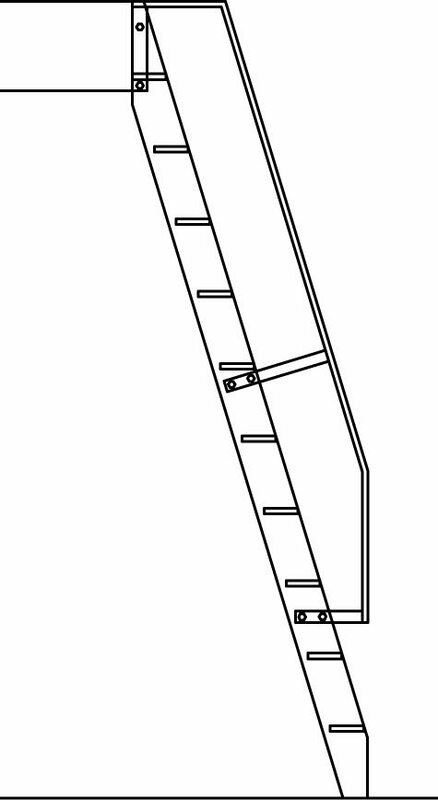 We recommend a more normal ship ladder than this version if at all possible. 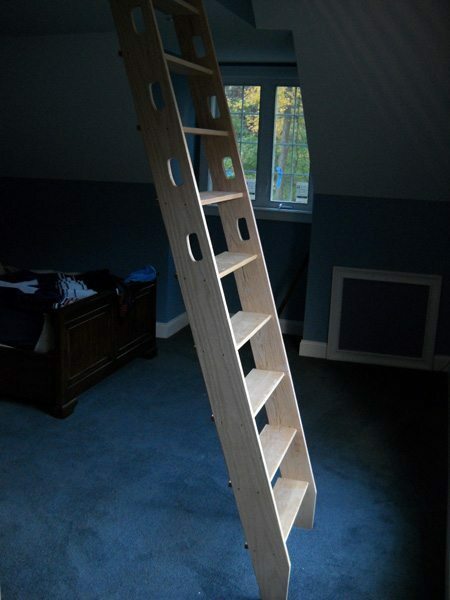 This is an alternating tread stair. 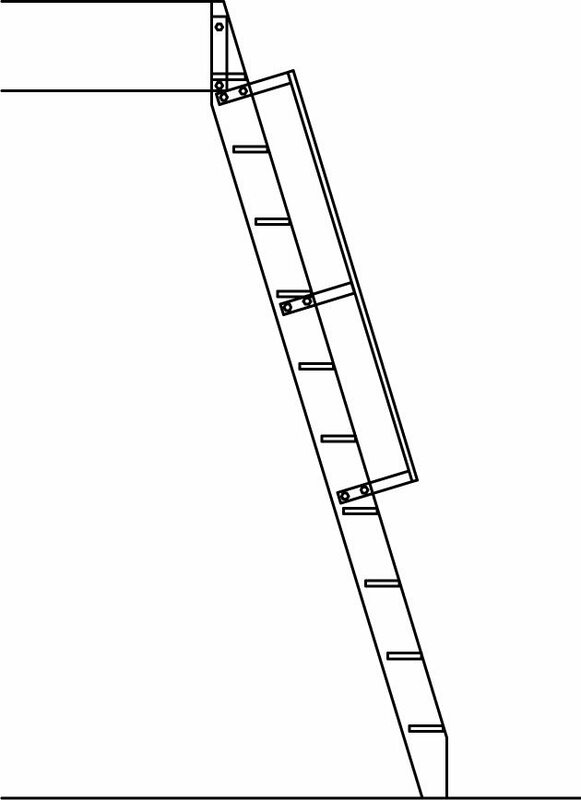 The riser height is reduced and the run is longer than a typical ship ladder, but the steps alternate. 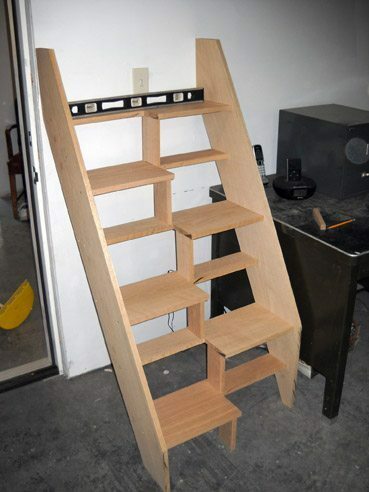 This stair saves space and you can go down face forward. 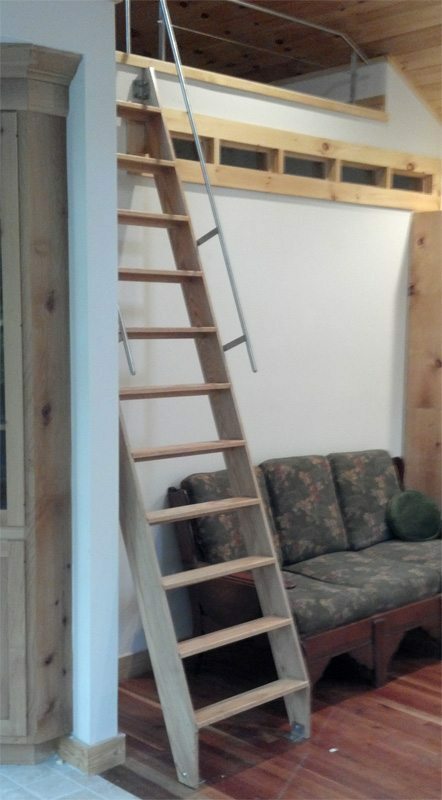 Since the treads alternate, this stair is not considered to be as safe as a standard ship ladder or spiral stair. You must go down this stair according to its pattern. We make these only upon special request. 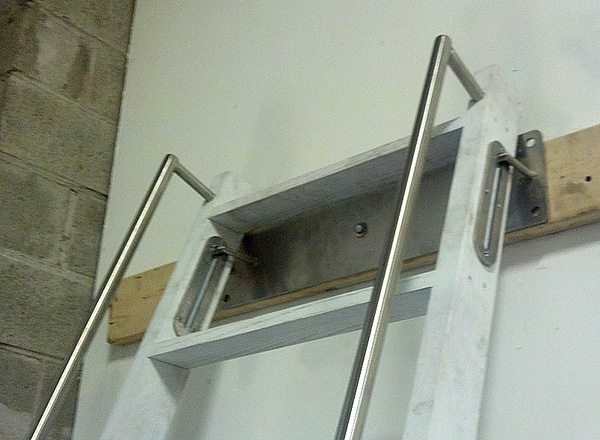 This is a custom oak ship ladder with stainless steel hardware, stainless steel railings on both sides in safety-top configuration. 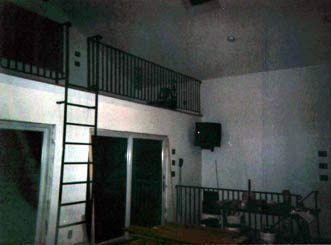 The sleeping loft had low ceilings & we fabricated custom railing with a stainless steel cable for added safety and style. 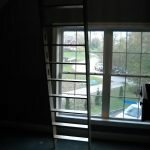 The top stringer mount was custom cut to conform to the window trim at the top. 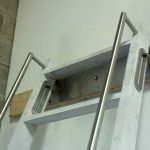 The hardware is stainless steel to match the stair railing and balcony cable rails. 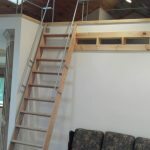 Here is a picture of the custom oak ladder in our shop before the stainless railing and hardware pre-fitted on the stair. We remove the stainless steel parts for ease of delivery. 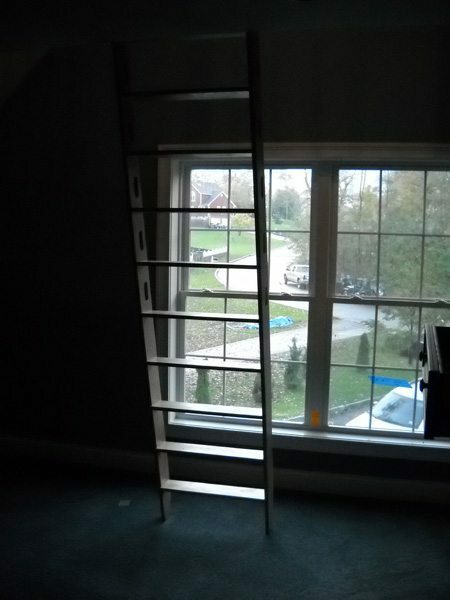 This is a close-up of the ladder rail top. It is 1″ o.d. stainless steel. The stand-offs are 3/4″ round. 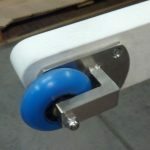 The handrail is spaced 3 1/2″ off the stringer for ease of use. 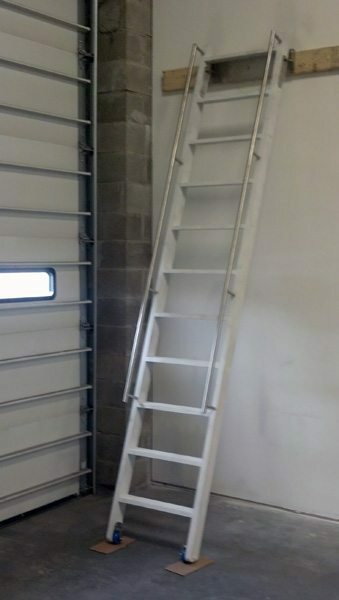 The bottom of the stainless steel ladder rail. 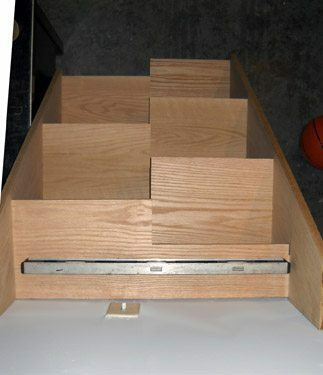 This is a close-up of the top bracket that allows the stair to slide up & out of the way when not in use. 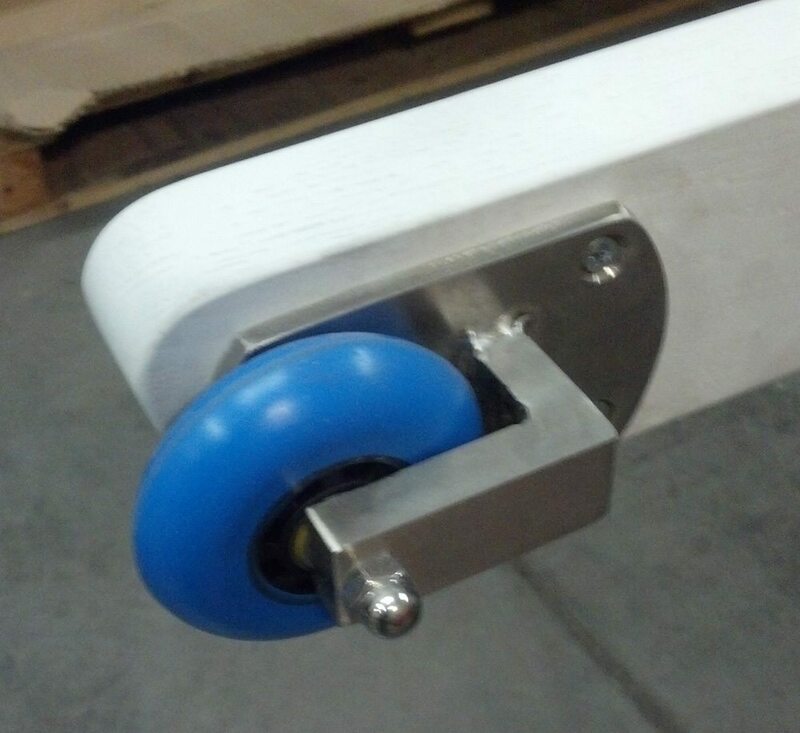 A close-up of the stainless steel wheel assembly for the Rolling ship ladder. 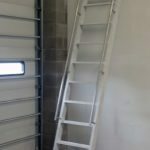 This is a white ship ladder with stainless steel railing and a special wheel & bracket system that allows the stair to slide against the wall & out of the way. 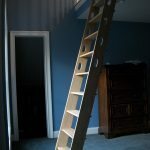 The 2 Directional Ship Ladder Sliding Bracket allows you to slide your Ship Ladder back to the wall and then to the side to get it out of the way.